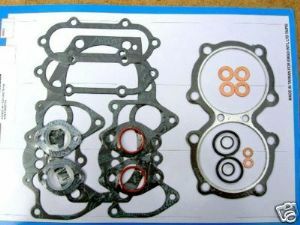 Gasket Set Top End Triumph Unit 750 Twins All 4-valve Models. Gasket Set, Top End, Triumph Unit 750 Twins, All 4-valve Models. This is a top end gasket, copper washer, and o-ring set, of very good quality, to fit all unit 750 Triumphs from 1973-1979. It comes with a head gasket.